Week of January 20-24 is Exam Week! The week of January 20-24th is exam week at Pewaukee High School and marks the conclusion of first semester. For details on the exam schedule click on your class link or click here. Monday, January 20th is the last day of classes for the semester. Friday the 24th there are no classes for students. AP Art Show Is Up! 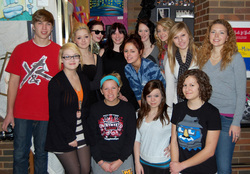 Mrs. Bjork's AP Studio Art Class opened their first semester exhibit. The PHS gallery is has transitioned to a beautiful comprehensive display of the art by these talented Juniors and Seniors. This exhibit is the exam for students and is always a big treat to see. Congratulations to Ally Pfister, Ryan Harris, Shelby Cieszki, Marissa Fritz, Erika Jackson, Madison Schaefer, Morgan Aschenbrenner, Morgan Johnson and Aspen Johnson on their outstanding exhibit! 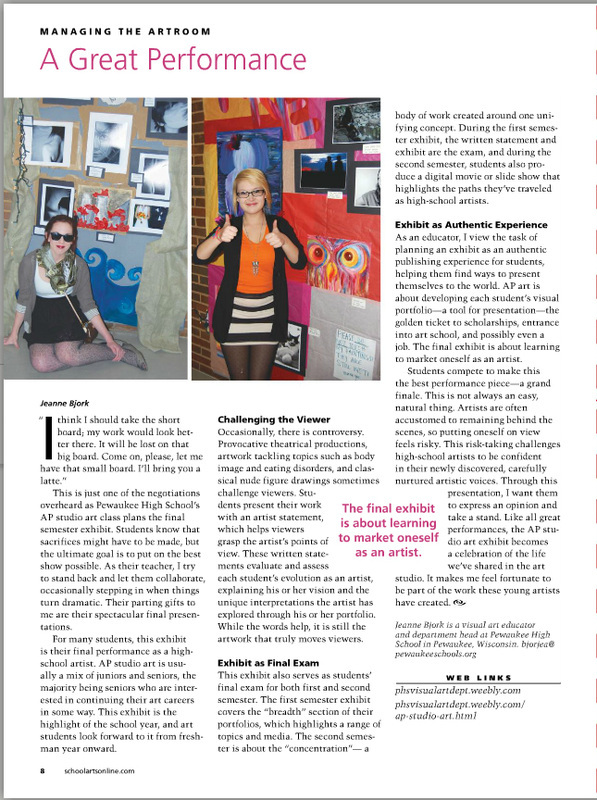 For details on Presenting and the PHS Art program see the article to the right from School Arts Magazine. Click here to view a slideshow of students installing the show. Students will have more options in the Visual Art department as they register for the 2014-14 school year. In December the Pewaukee School District School Board approved changes that had been presented on November 25th by Mrs. Bjork. These include a more streamlined approach to prerequisites, additional Digital Art Classes and more opportunities to take advanced courses within the art department. A new one semester Intro to Art course replaces the year-long Art Fundamentals prerequisite. The addition of an Intro to Digital Media course that includes experiences in Animation, Digital Photography, Video and Digital Painting using iPads. The revision of the Art History course to include a travel experience to Chicago, Minneapolis or New York City in 2014-15 (to be determined) and eventually a travel abroad experience in future years. To View a Detailed Scope and Sequence Click here or click the image at the top of this article. There are lots of art galleries within this site. If you click on the class tab at the top a drop down menu will show all the classes we offer in the Visual Art Department. Each of those pages has a gallery of some of the works created by students in the course. 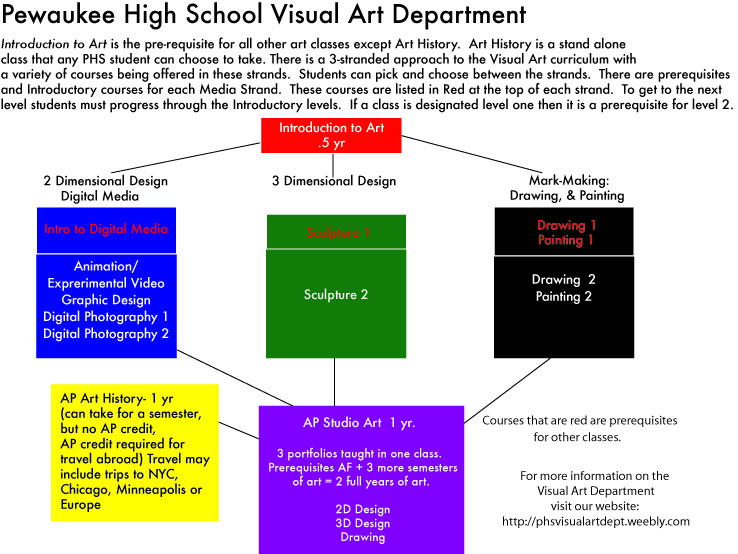 There is also a chart of all the courses offered that may be helpful to plan your art future. So Why This Website, Not School Fusion? We decided this site could provide us more flexible options to highlight the many fabulous accomplishments of our students. School Fusion will be the basic splash page for you and your student to access a link to this site. At each School Fusion Class page you will find a link to the class page for that specific course here. Now that Pewaukee High School is a Google school and students have google accounts we decided to utilize the many tools that Google has to offer. To that end, homework assignments and deadlines will all be posted via the Google Calendar embedded on the Calendar Tab. Students will be given instructions how to subscribe to the calendar or they can always just visit the tab. When you click on a calendar event it will give you a description of the event details. 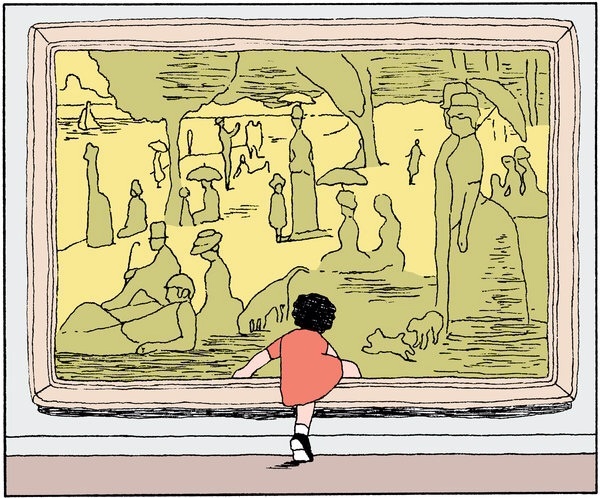 You may also want to subscribe to the Art Blog embedded here on the site. There will be updates and Art News posted regularly. You can subscribe via RSS or email. Click here for an archive of September-December 2013 news. Meet Ben Lamp, the new Visual Art teacher at Pewaukee High School. Please welcome him and his fantastic ideas to PHS! Here's a bit more about him. Hi, I am excited to begin my first year teaching Art Fundamentals, Sculpture, and Fashion Analysis at Pewaukee High School. This will be my eighth year teaching Art at the high school level, and I love sharing my passion for art with aspiring young artists. I look forward to working with a new group of students, encouraging their artistic abilities, and sharing new artistic experiences. During my free time, I love spending time with my wife, son, and friends. I also enjoy a variety of sports, playing golf, fishing, and creating my own art, of course. The Visual Art Department is thrilled to announce that five of our talented art students have been recognized with honorable mention awards for the Scholastic Art Contest. The Scholastic Art contest is a national art competition with students competing against other state visual art students for award recognition. It is extremely difficult to be recognized making us truly proud of our Pewaukee High School Visual Art students! Mrs. Bjork’s Animation students Kelly Kempen and Sam Knepprath and her AP Art Studio student Erika Jackson. Congratulations to these talented artists. They will receive their award in February at the Milwaukee Art Museum. The Slide show and animations below represent some of the works entered and some of those chosen. Mrs. Bjork wrote an article about one of the new National Standards on Presenting for Davis Publications' School Arts Magazine, a national art education article. The article featured information about Pewaukee High School AP Art students and the exhibit they present each school year in January and again in May. Check out this link to see the article or just click the picture below. Here is a slide show of last year's Tile-A-Mile fundraising event for the visual art department. The proceeds of this event support the visual art scholarship fund and departmental program needs. Participants purchase tiles for $10.00 and paint them. These tiles are then displayed around school with the hope of someday having a mile-long art installation. There are also artist demonstrations, a student art exhibit, bake sale, raffle and silent auction. The event is run by Mrs. Bjork and the Art Club and a small dedicated group of parent volunteers. SAVE THE DATE FOR TILE A MILE 2014, SATURDAY, MARCH 1st 10:00 - 1:00.